Copyright: © 2019 Dai D, et al. This is an open access article distributed under the Creative Commons Attribution License, which permits unrestricted use, distribution, and reproduction in any medium, provided the original work is properly cited. Rosai-Dorfman disease (RDD) is an idiopathic, benign proliferation of histiocytes that can be present in multiple organs such as lymph node, skin, soft tissue, orbit, central nerve system and bone; however, it rarely occurs in the breast. In general, RDD is a painless, firm and poorly defined lesion, which can radiologically mimic a breast cancer and is therefore an important differential consideration. The diagnosis of breast RDD is challenging, especially on a small biopsy specimen. We report a unique case of breast RDD with a literature review including common presentation, differential diagnosis, and recommended management. A high index of suspicion for this rare entity is essential to render a correct diagnosis, thereby avoiding unnecessary diagnostic tests and treatment. Rosai-Dorfman disease (RDD), or sinus histiocytosis with massive lymphadenopathy, is an uncommon, benign, histiocytic proliferative disorder with poorly defined pathogenesis. Initially, it was described by Rosai and Dorfman in 1969 . The characteristic histology features a S100 positive histiocytic proliferation with lymphoplasmacytic infiltrate, and the hallmark finding of emperipolesis [1,2]. RDD is often seen in children and young adults, with a slight propensity for males, and may occur in any part of the body. Usually, RDD presents with painless lymphadenopathy, predominantly in cervical lymph nodes and often bilateral . Extranodal RDD accounts for nearly 40% of all RDD cases and most commonly is seen in the skin, upper respiratory tract, and bone . The breast is rarely involved in RDD. So far, 34 cases of breast RDD are reported in the English literature. RDD of the breast usually presents as an asymptomatic, solitary mass lesion with irregular borders and increased vascularity on radiographic study, which may mimic invasive breast cancer. Due to its rarity, pathologic diagnosis of breast RDD is challenging, especially in a small biopsy sample with limited tissue. In this report, we discuss a case of breast RDD with a literature review. A 42-year-old asymptomatic female underwent a routine screening mammogram. Imaging study revealed a dense, mass lesion with irregular borders in the upper outer quadrant of the left breast (Figure 1A). Subsequently, it was confirmed by a spot compression mammogram (Figure 1B). The ultrasound examination showed a 1.1 cm hypoechoic mass with irregular margins at the 11 o’clock position (Figure 1C). The patient underwent core needle biopsy, the standard of care for a Breast Imaging-Reporting and Data System (BIRADS) 4 lesion. The final pathological diagnosis for the core needle biopsy was Rosai-Dorfman disease. Subsequently, a lumpectomy was performed. Gross examination of the lumpectomy specimen showed a 1.5 x 1.2 x 1.0 cm, white-tan, firm, and ill-defined mass with no necrosis identified. 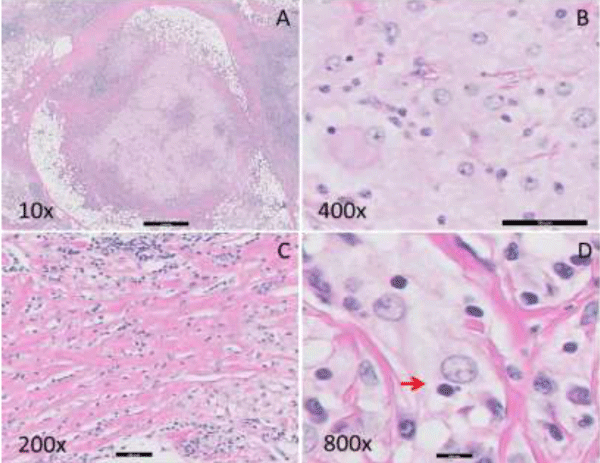 Histologic examination of the mass revealed a histiocytic proliferation in a sheet-like and nodular pattern admixed with dense, hyalinized collagen bands (Figure 2A,C). The Hyalinizing fibrosis was prominent at the periphery of the lesion. Large, polygonal histiocytes form syncytia with abundant pale and foamy cytoplasm and indistinct cell borders. Intermediate to large round, vesicular nuclei were present, usually eccentrically located with small conspicuous nucleoli (Figure 2B). Scattered histiocytes with engulfed intact lymphocytes and plasma cells were identified, indicative of emperipolesis (Figure 2D). A dense, lymphoplasmacytic infiltrate was present focally (Figure 2A,C). The histiocytic mass infiltrated into adjacent adipose tissue and involved the surgical resection margin. The immunohistochemical study of S100, CD1a, CD68, CD20, CD3, and CD5 was performed on the resection specimen. The lesional histiocytes displayed diffuse strong positivity for both S100 (Figure 3A) and CD68 (Figure 3B), and were negative for CD1a (Figure 3C). CD3, CD5 and CD20 stains demonstrated the presence of a mixed population of B and T lymphocytes. Kappa and lambda in-situ hybridization indicated the presence of polyclonal plasma cells. No pancytokeratin positive epithelial component was identified. Modified Ziehl-Nelson, Gomori’s methenamine silver (GMS) acid periodic acid– schiff (PAS) stains were negative for mycobacteria, fungus, or other and (acid) fast-organisms. The patient has been followed for three years without any evidence of recurrence or malignant transformation on clinical exam or imaging studies. Figure 1: Imaging study in the left breast mass. A. Sonogram showing an irregular, solid, well circumscribed, hypo echoic lesion. B. Screening mammogram demonstrating an irregular mass lesion with high density. C. Mammogram with spot compression displaying a well-defined mass lesion with an infiltrating margin. Figure 2: Histopathologic findings of the breast mass. A. Nodular proliferation of histiocytes with dense lymphoplasmacytic infiltration and peripheral thick hyalinizing fibrotic bands (10 X). B. Histiocytes with a round nucleus, inconspicuous nucleolus and abundant pale and foamy cytoplasm (400 X). C. Dense lymphocytic infiltration and thick collagen bundles (200 X). D. Emperipolesis of a lymphocyte by the large histiocyte as indicated by arrow “→“ (800 X). Figure 3: Immunohistochemical study of the breast mass (400 X). A. S100: Lesional histiocytes showed strongly diffuse membranous and nuclear positivity; B. CD68: Lesional histiocytes showed positivity; C. CD1a: Negative for lesional histiocytes. RDD most commonly involves lymph nodes, where the characteristic features are sinus expansion by histiocytes, prominent emperipolesis and histiocyte proliferation resulting in lymphadenopathy. This constellation of findings is not seen in extranodal RDD, such as breast RDD, due to the absence of sinus architecture and the presence of hyalinizing fibrosis, which may make the diagnosis more challenging. Diagnosis of breast RDD by a core needle biopsy is complicated by limited tissue, which may not reveal the characteristic features. In our case, a core needle biopsy showed distinct histiocyte-rich and lymphocyte rich areas with rare emperipolesis. Immunohistochemical studies support the diagnosis . Only a few of the reported cases of breast RDD were successfully diagnosed by fine needle aspiration biopsy and cytologic evaluation [7,8,17-19]. Those diagnoses were based, primarily, on identification of the hallmark feature of emperipolesis. Breast RDD usually presents as a painless, palpable mass lesion, which may be found incidentally on routine screening mammography. 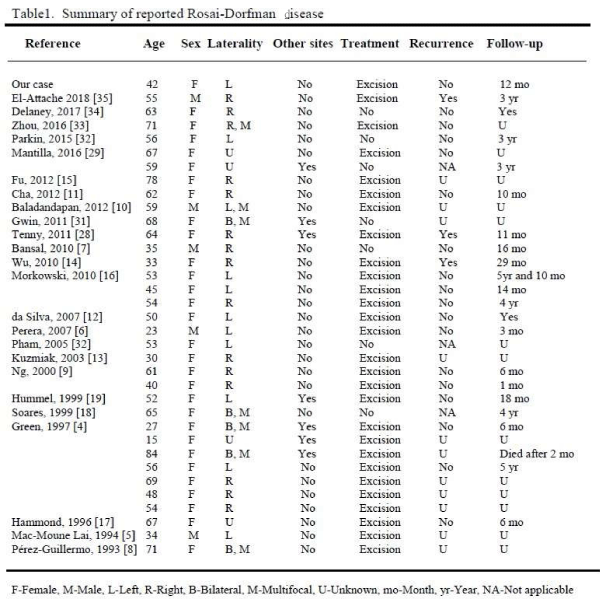 So far, there are 34 cases of breast RDD reported (Table 1) in the English literature. The age range is from 15 to 84 years with a mean age of 53.2 years. Breast RDD was seen in both females and males with a female predominance (85.2%). The ratio of female to male was 5.8 to 1. Among those reported cases of breast RDD, 4 cases involved skin, showing deep dermal and subcutaneous lesions [4-7]. Three cases involved intra-mammary lymph nodes [8-10]. Twenty-seven cases primarily involved breast parenchyma (Table 1). Six of 34 (17.6%) patients had multiple mass lesions, either unilateral or bilateral. Seven patients (20.5%) had synchronous or metachronous nodal or non-mammary extra-nodal disease (Table 1). Ultrasonography usually showed a hypoechoic lesion in breast RDD. Radiological features were variable with some cases presenting as a benign lesion, such as fat necrosis , and most presenting suspicious for malignancy, as BIRADS 4 or 5 [12,13]. Occasionally, positron-emission tomography (PET) scan demonstrated a hypermetabolic lesion [14,15]. Table 1: Summary of reported Rosai-Dorfman disease. The histologic differential diagnosis includes idiopathic granulomatous mastitis, granulomatous inflammation, Langerhans’ histiocytosis, fibrous histiocytoma, and histiocytic malignancy . The pathophysiology remains uncertain. Recently, both infectious and immune mechanisms have been proposed  for breast RDD. Definitive association with a specific organism has not been identified. Foucar et al., reported that many patients showed serum polyclonal gammopathy and plasma cell proliferation. A subset of patients also manifested various immune disorders including autoimmune hemolytic anemia, immune arthritis and glomerulonephritis . Cha and Fu et al., reported that increased IgG4 plasma cells were observed, especially in breast RDD with prominent fibrosis [11,15]. Correlation of breast RDD and IgG4 related sclerosing mastitis has been investigated. The outcomes and mechanism remain unclear . RDD has responded well to steroid treatment, which suggests RDD may be related to immune dysfunction . Further studies are needed to clarify the pathogenesis. RDD primarily is considered an indolent, benign, reactive process with a histiocytic proliferation of unknown etiology. The majority of patients with RDD follow a variable, benign course with some patients experiencing recurrences, exacerbations or stable disease for years. The reported mortality is extremely low. In our series, spontaneous remission was seen in one middle aged male patient 6 months after initial diagnosis . The risk factors for a poor prognosis include older age, concurrent immunologic dysfunction, systemic diseases, and involvement of vital internal organs such as kidneys, lung and liver [1,24-27]. In rare cases, mass formation or infiltration caused by RDD can be a direct cause of death . In our series, one elderly female patient died of disseminated RDD 2 months after diagnosis . Recent molecular study revealed that genetic abnormalities were identified in certain cases of RDD, which showed mutations in KRAS and MAP2K1 genes [36,37]. So far, no molecular alteration was identified in breast RDD. The molecular results indicated there may be a neoplastic pathway involved in RDD. Our patient was treated by surgical resection with positive surgical margins. The patient was followed up for at least three years. No recurrence was observed. Currently, there are no guidelines for treating RDD. The majority of extranodal lesions are treated surgically. Based on our literature review, 28 of 34 (82.3%) patients were treated with a surgical excision (Table 1). Short term postoperative follow up is necessary as disease recurrences occur. Patients with normal immune function and no coexisting systemic diseases may be returned to routine care. We conclude that RDD is a benign clinical process with histiocytic proliferation showing hallmark finding of emperipolesis. The RDD lesion demonstrates positivity of S100 and CD68, and negativity of CD1a by immunohistochemical study. Current common treatment modality is surgical resection with rare recurrence. The presented investigations and the publication of data comply with ethical rules of East Carolina University and general rules of experimentation with humans. There are no potential conflicts of interest with respect to the research, authorship, and/or publication of this article.